As you have been reading along, you have probably come to understand how important pewter is to dating the ship – particularly the pewter plates with their maker’s marks and hallmarks. So far, we have identified over 20 plates or similar tableware and over 35 fragments of the same. Conversely, we have only recovered 7 spoons – including 2 bowl fragments and 1 end piece. Why the disparity, why so fewer utensils? A simple, yet very useful tool, the history of the spoon is long and interesting – some archaeological findings date spoons back to 1000 B.C. where they are found in the possessions of a select group of Egyptian priests and Pharaohs. Movements in technology are often more evident in the wealthy classes first – this holds true for the spoon as well. For example, Ancient Greece and the Roman Empire saw metal spoons among the wealthy class of people. In Medieval Europe, spoons were made from a wide range of materials to include cow horns, wood, brass and pewter. By the 15th century, metal was widely used in place of wooden spoons. This advancement led to many design changes and by the end of the 18th century the spoon achieved the modern look we have today. Of particular interest to us in dating our spoons is the evolution of the spoon during the second half of the 17th century. During this period, the bowl became wider and eventually the join of the bowl to the stem was reinforced with a spinal rib extending down the bowl. This feature is called a rat tail and can be seen not only on the backs of the spoons pictured here, but also clearly in the X-ray. All four of the bowls we have at present have the rat tail. Though this detail helps us with a generic dating of the spoon, it is difficult to identify them more specifically as their handle is shortened or missing entirely. Furthermore, we have not determined if our spoons were shortened intentionally or broken before or during the wrecking of the QAR; however, this modification is a historically and archaeologically documented practice among sailors in the late 18th century. Why? So sailors’ personal spoons would more easily fit within their pockets. Could this be why we find so few spoons – they simply left the ship in the pockets of their respective pirate owners? Granted, its only one answer among many possibilities, but it does make one think how different shipboard life was 300 years ago. -“History of the Spoon.” Eating Utensils. Accessed March 27, 2019. -Broadwater, J. Final Report of the Yorktown Shipwreck Archaeological Project 1. 5 volumes submitted to NEH, Williamsburg, VA, 1996. -Cox, S. “Personal Items Recovered from the Storm Wreck, a Late 18th-Century Shipwreck off the Coast of St. Augustine, Florida.” St. Augustine Lighthouse Archaeological Maritime Program. Accessed March 25, 2019. -Hume, I.N. A Guide to Artifacts of Colonial America. Philadelphia: University of Pennsylvania Press, 1969. -Smith, S.O. The 1779 Shipwreck Defence: An American Revolutionary War Privateer. US: PAST Foundation Publications, 2008. 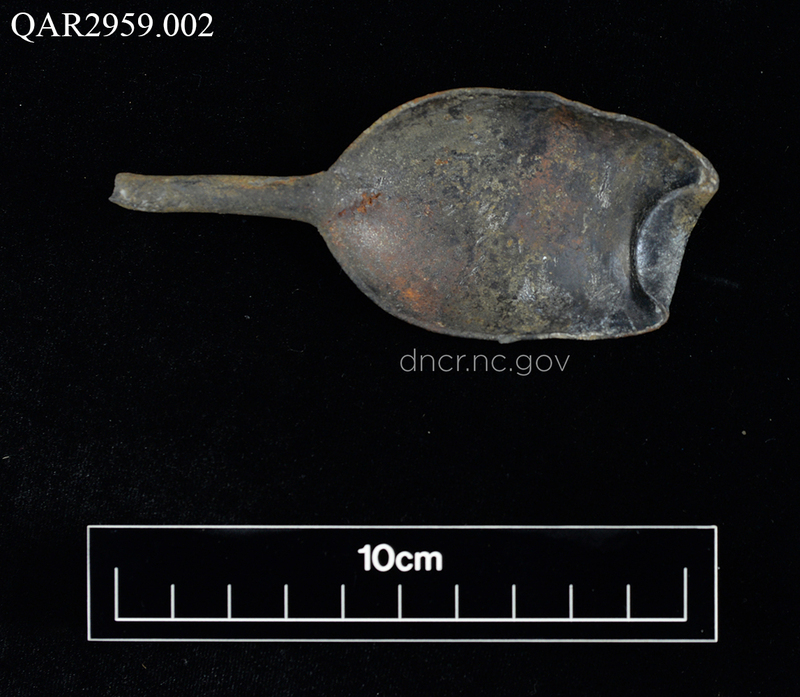 -Pewter spoon from the QAR site. Image by NC Department of Natural and Cultural Resources. 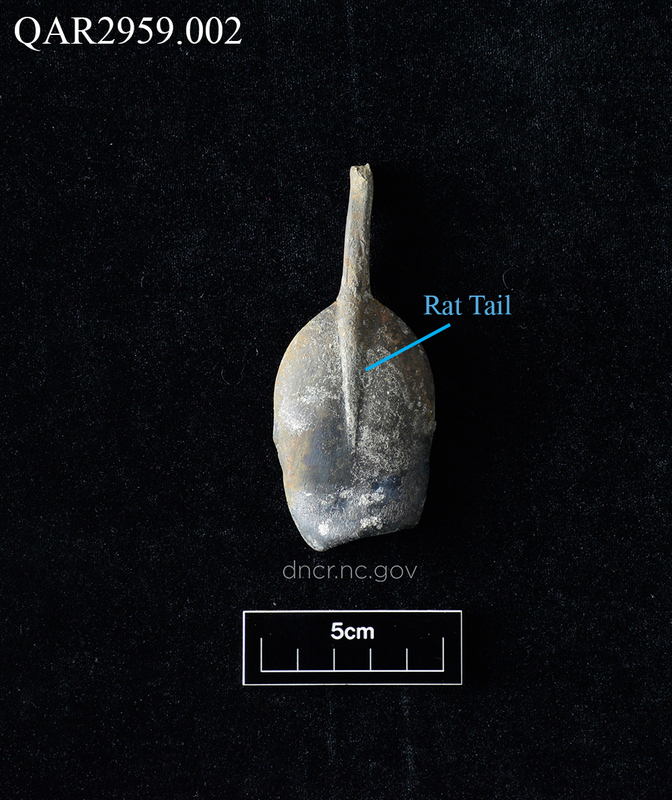 -Back of pewter spoon from the QAR site, showing rat tail. Image by NC Department of Natural and Cultural Resources. 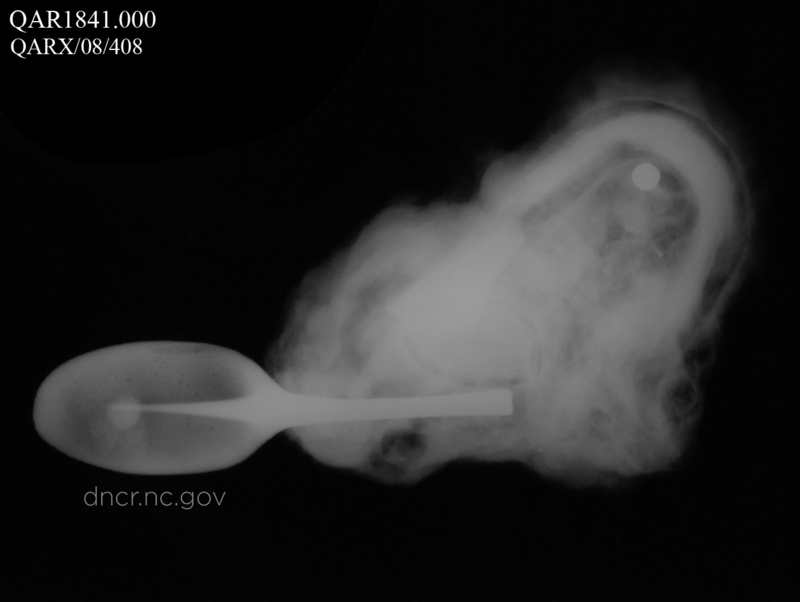 -X-ray of concretion with pewter spoon from the QAR site. Image by NC Department of Natural and Cultural Resources.